[%pageBreakSettings nobreak=true] At the farmers' market, I have already purchased a big bunch of collard raab when I see the tiny booth with its precious microgreens and less-than-mainstream varieties. I come in for the jewel-like pickled peppers, but then I see a hand-lettered sign, in cursive, saying "cima di rapini." You say it "cheema," and I'm transported. I can't pay for it quickly enough; it has hard flowering buds like the other raabs, but its stems are pale green and slender, like a daffodil's. And its Italian name has me swooning. Cima di rapini. I say it over and over again to myself as I walk away, my market bag straining my back with, now, $96 in greens, bacon, cheeses, little carrots, bagels, a chicken, eggs, Portuguese sausage, bounty galore. The next night, everyone has fallen asleep early except for Monroe and me. He stands, wobbly, at my feet as I prepare the rapini. I cannot find a recipe for it; no matter, I'll cook it the way I always cook greens. I notice that my bunch is tied in a rough bow with something that looks like tender straw. This is that sort of farm, the kind that doesn't even buy wire ties for you to use for a minute, then throw away. I am in love. I put the tie in the compost bucket and rinse the gorgeous rapini. Some of the stalks seem woody, so I cut the lower leaf from each and then chop off the stalk under the second-lowest leaf, leaving only the part holding the leaves and blossoms together. I prepare my big cast-iron sauté pan, heating a little olive oil and chopping some garlic roughly, sprinkling in a generous pinch of sea salt. Monroe gurgles happily as I give him a piece of bread. I would cook an entire meal, but it's just the two of us, and I am desperate to try this produce before it fades from vibrancy. I keep reading about how vitamins dissipate as soon as a vegetable is harvested, and I am not going to let this calcium and vitamin C, the vitamin A and K, the folate, the potassium and manganese, the untold other minerals, wilt in my crisper. No, not I. And Monroe loves greens with a passion; on our way home from the farmers' market, he was reaching into my bag from his baby carrier, grabbing as much Swiss chard and carrot greens as he could fit into his mouth, chewing with his six teeth. The garlic and olive oil together smell wonderful, and I throw in the rapini, still glistening from its bath in the sink. I pick Monroe up for a bit and we stir it, inhaling the scents. Monroe keeps trying to reach for the hot pan, so I have to swivel him away as the greens spit and dance. I have shallots, so I peel a few and slice them; the brilliant green is now harmonized with pink, creamy half-circles. I give Monroe a piece of Oregonzola; he is fussing again, he wants something substantial, essential. I pick out a stem of green and hold it for a minute in the air, letting it cool, and give it to him. He holds it up, too, one hand balancing his unsteady body against the oven, the other letting the rapini fall into his little mouth; he works it hungrily. I unconsciously imitate him and we are both standing, chins upturned, chewing cima di rapini as if it is food of the gods. It is my dinner: cima di rapini, Oregonzola, a toasted bagel. After I eat, I idly look up the farm, glad I have the jar of Jimmy Nardello peppers here to refer to. I find the website easily and immediately see the message: "Gales Meadow Farm needs your help!" I click, half-expecting something sweet and farm-y. A barn raising. A CSA raising! "Outside investors are planning to build two massive new pipelines to transport imported natural gas through the Gales Creek Valley. We don't need them and we don't want them! But these investors have "eminent domain." They can run their pipelines across private property without the owner's permission. Gales Meadow Farm needs your help! Both of these proposed gas pipelines will run the length of our farm, with the "construction easements" completely consuming our main field. We will be wiped out." I know about eminent domain and construction easements. I used to date an attorney. I also know "we will be wiped out." Those are strong words. I haven't driven my car in nearly two years. The overuse of fossil fuels in our society today makes me want to cry, deep shivering sobs. This wondrous farm, wiped out for more of them? By our own crunchy Oregon government? No. Oh no. Not on my watch. I click to email the governor; I'm shaking with fury. I try to not sound like a hippie nutcase, even though that is what I am becoming. I think about those greens, I think about all the greens in this country, I see them being sucked up like a horror movie to pipe oil around from state to state, to feed the ever-growing social hunger for the black stuff. I know that I am being dramatic. But only a little. Do your part. Email the governor. 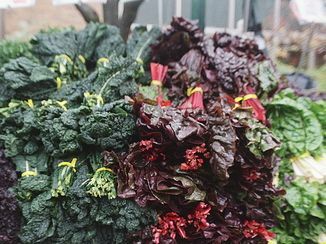 If it's not your governor, well, at least, you can go to the farmers' market and find someone selling rapini. Buy some. Take it home, and share it with someone you love.